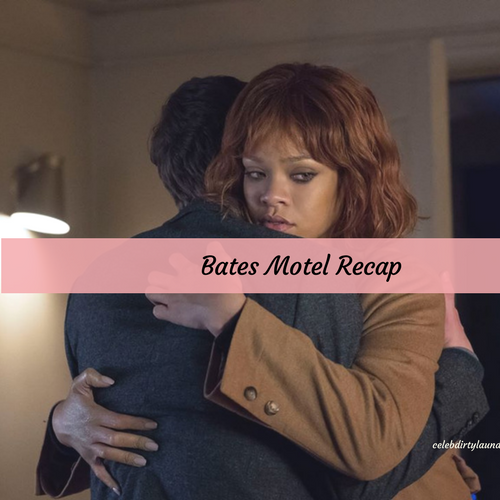 Bates Motel begins tonight with Sam Loomis (Austin Nichols) laying dead in the motel bathroom and Norman Bates (Freddie Highmore) trembling as he holds the bloody knife. His mother, Norma Louise (Vera Farmiga) tells him to turn off the faucet and if he wants to play with the big kids he has to act like one; ordering him to clean up and change his clothes. She tells him he is in shock, but he will live and can think about the meaning of life later, but right now they have stuff to do. Norman drives through the rain saying he just killed someone. Norma tells him he painted her in a corner and now he has to deal with it. He says he is trying, as he drives Sam’s car into the forest, but hid among trees as they see police lights ahead. Once back in the car, Norman has a melt down saying it was Jim Blackwell, and Sheriff Greene (Brooke Smith) is going to piece it all together. Norma slaps Norman to calm him down, when he recovers he slaps her back. She says they need to focus on getting rid of Sam’s body. When she slips up, Norman asks how many times have they done this and how many bodies are in that lake? She tells him that there is a lot at stake right now, if they connect the crimes to him, he could be killed or put in a mental institution and feed him medications; either way it will be the end of him and her. She tells him they will dump the body in the woods and they don’t have time for his emotional meltdowns. They are carrying Sam’s body when they come upon a well; Norman says he can’t believe he did this because he didn’t deserve to die. Norma tosses the body into the well and tells him to make a wish. Norman and his mother are walking home after they sell the car to a chop shop. She reminds him they need to micro clean the room when they get back. Norman asks her if he should just turn himself in? He admits he doesn’t want to be killed or locked up but what they’re doing is wrong. Norma feels she shouldn’t have told him the truth because it seems to be too much. She suggests that if it happens again, that its too much she could take over completely; he says that isn’t an option. As they are talking Sheriff Greene arrives, Norman runs over as his mother tells him to not do anything stupid if he loves her. She informs him they have found multiple bodies down at the lake last night, and one of them was Jim Blackwell. He appears to be shocked and she says she just wanted him to know that he won’t be bothering him anymore, but still wants to know why Blackwell had his address, and what Alex Romero (Nestor Carbonell) has to do with it. She notices the tire tracks in the gravel, Norman covers saying it was a guest who must have left in a hurry. Norman says he hasn’t had any real guests, only ones who rented the room for a few hours. She tells him to take care and Norman stays to see her off. Romero wakes up and Mary serves him a huge breakfast in bed. She gives him antibiotics, which he thanks her for saying she saved his life. Romero confronts her, saying he doesn’t remember much, but he had a gun on him when he arrived and wants to know where it is. She tells him he probably lost it, and she will be back soon to retrieve his food tray. Norman brings down a wheelchair and when Norma returns home he says the police found multiple bodies and if they think it has to do with Norman, they would do a search of the house and he needs to get everything out that could be suspicious, Norma agrees to help. She wants to know what he is going to do with her body. He says there is a spot in the woods where there is snow, and a beautiful clearing. Norman tells her to go down to the motel and replace the shower curtain. She reluctantly leaves as he brings his mother’s body up and treks through the woods to the spot they found earlier. He digs up a spot deep enough to put her body on, promises her he will be back as soon as he can and kisses her, saying he loves her. He covers her with a blanket and leaves. Dylan Massett (Max Thieriot) returns to the motel and home, he sits in his truck and stares with sadness at the home until Norman arrives. Norman offers to make him something to eat, while Dylan looks around the home, where he sees dead flowers, cigarettes and women’s shoes. He walks into the kitchen, which is a mess, asking Norman if he has been living there this whole time by himself, saying he should have called him. He says the hotel is still running. Norman asks about Emma (Olivia Cooke). Dylan says they got married, and have a baby girl named Katie. Norman stares at the photo and apologizes for not calling him nor seen him in a long time. He sees his mother, and quickly turns away from Dylan, which confuses him. Dylan asks if he is still seeing his therapist, Dr. Edwards. Norman says no and stopped seeing him after their mother died. He says he is off his medications too and doesn’t feel like he needs them. He leans in whispering that he misses their mother and it will never be the same again. Dylan says he doesn’t think he is well and shouldn’t be living there alone. Norman says living any other way is not an option. Dylan says he is going to stay with him for a few days and together they will get this all figured out. Norman says he doesn’t feel well, he is going to lay down, but Dylan should make himself at home. Dylan goes upstairs, and sits in his mother’s room and begins to cry. He stares at her housecoat and says he is sorry and begs for her forgiveness. Romero searches the house for his gun, Mary finds him and he demands to have it. She says he is one of the kindest people in her life and a decent man; she wants to know what happened. She knows he is working by his own moral compass and wants to know if it has to do with Norma Bates. She asks him if he knows who killed Norma after he admits she didn’t kill herself. He stands up and tells her to stay out of it but to make sure his gun is there when he is well enough to go. Norman wakes up with his mother staring at him, she says she has only been there for a little while; but they need to talk about Dylan. She says Dylan cannot stay, he may be coming from a good place but he is misguided and never understood their relationship. She says the reality is Dylan can no longer be in their lives; it has to be only the two of them. Norman says he understands, she tells him to make a nice dinner for the two of them, convince Dylan he is fine and then make him leave. At the pharmacy, Dylan learns that Dr. Edwards went missing just over a year ago and presumed dead, so they cannot refill Norman’s expired prescriptions. Dylan shares that his brother needs his meds because he believes he saw the doctor a few days ago, and if he doesn’t get them soon he is worried something bad is going to happen. Dylan returns that night to the house, catching Madeleine Loomis (Isabelle McNally) walking up the stairs. She is shocked to learn Norman has a brother, she confides in Dylan that her husband is missing and Norman might have seen him. She doesn’t know where else to go, but Dylan tells her Norman is in a fragile state, and he doesn’t want him to get upset. He shares that Norman has mental issues and he just needs to get him in a safe place with a controlled environment. Madeleine had no idea, Dylan gets her husband’s name and says he will ask Norman himself. Dylan comes to the kitchen where Norman has music playing and making dinner. Dylan says he just ran into Madeleine Loomis who is looking for her husband. Norman brushes it off, saying he barely knows them and tells Dylan to take a seat so they can eat. Norman begins to eat as Dylan stares at him and asks if he knows what happened to him. Dylan wants to know if Sam came there yesterday, Norman admits he was, saying Sam is not a very nice man, he was cheating on Madeleine, and him and his girlfriend rented a room, but by morning they were gone. Dylan pushes and Norman gets agitated saying he needs to stop confusing him and to stop meddling with the truth. He knows Dylan cares about him, but he asks him to just understand and let him live the way he needs to live. He urges Dylan to leave soon because he shouldn’t be there. Dylan sits next to Norman and tells him he only wants him to get better and he needs to trust him. He gives Norman the pills the pharmacy gave him, begging him to get help. He asks him to take one in front of him so he knows he is taking them, Norman struggles, tears down his face, he takes a pill in his hand and goes to the sink to get some water. Norman tells mother to stay out of it, but she says she just wants to talk to him. Norman turns around acting like he is Norma, saying she knows Dylan means well and he may not believe her, but she is so proud of him. She tells him she loves him but unfortunately she can only be a real mother to one person and even though she loves him so very much, she says it pains her that he is getting in the way. Dylan gets smashed in the head by the glass, knocking him to the floor. She grabs the knife to stab Dylan. Norman jumps on her trying to stop her. Dylan is bleeding but observes Norman fighting with himself, acting like he is physically fighting his mother. He calls 9-11, saying he’d like to report a murder and his name is Norman Bates, saying he killed Sam Loomis. Dylan looks at him in utter shock.